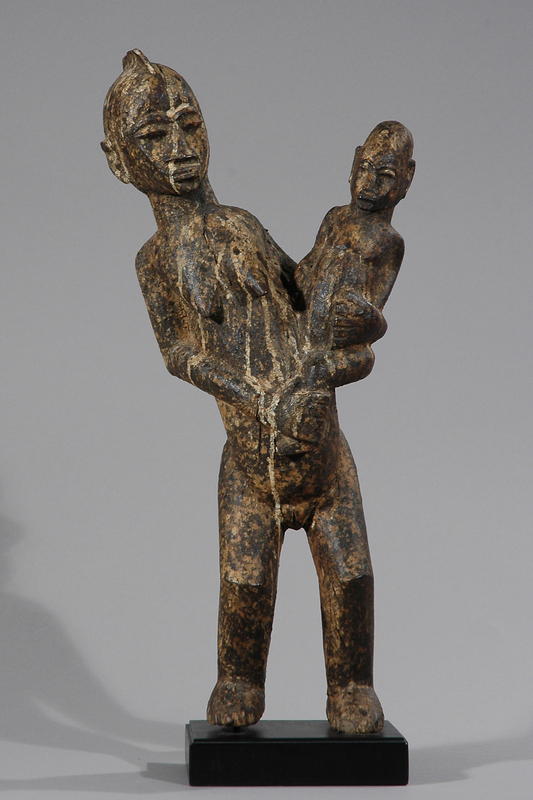 This outstanding and beautifully-rendered sculpture is a very rare variant of a bateba thil figure from the Lobi group. 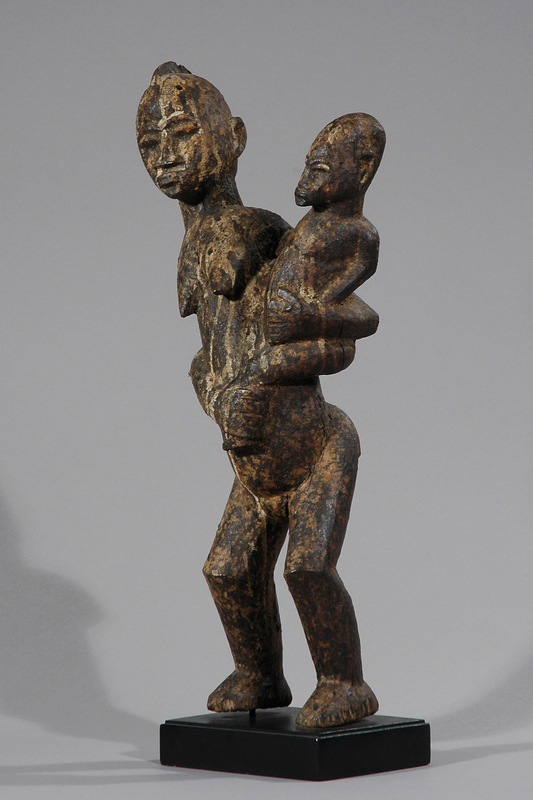 Lobi Bateba figures are believed to be able to act in behalf of their owner, they are considered a living being and have the ability to act out against forces that could harm it´s owner depending on it´s intended purpose. 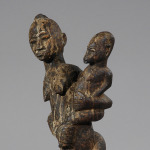 The maternity implications of the subject matter imply a further function for the piece, as bateba figures are typically single, and double-individual variants are usually erotically charged. 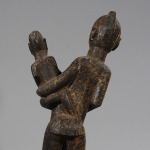 It shows a woman bearing a child on her right arm, leaning away from him as if in surprise. 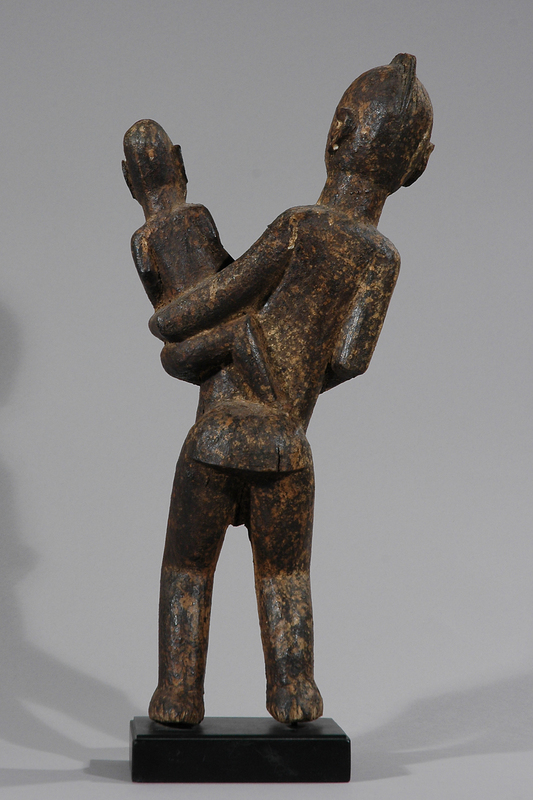 The manner in which this has been carved lends the sculpture a dynamism that is almost unprecedented in Lobi art, and making it unusual within the entire African art pantheon. 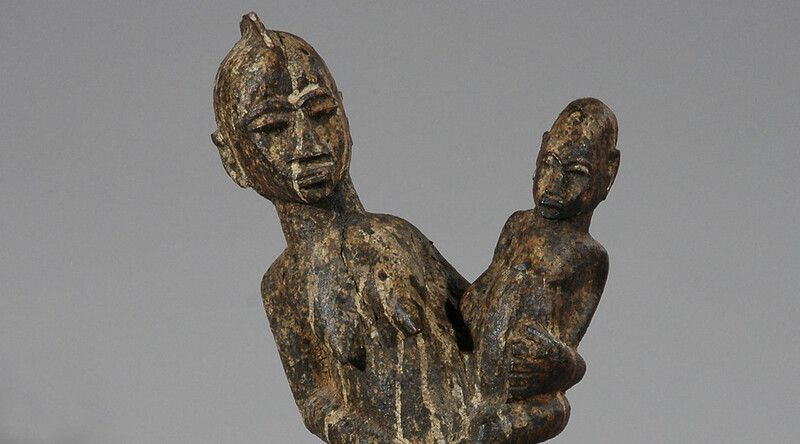 The mother is to the right, rendered in naturalistic proportions (Lobi pieces are usually somewhat out of proportion) with her legs braced, her trunk leaning to her right and her left hand on her upper thigh. Her fingers, pointed breasts, protuberant stomach and pointed navel– are all rendered with considerable care. The pose is so stiff that it may represent a metaphorical personage (perhaps a spirit), although the uniqueness of this piece makes conclusions uncertain. 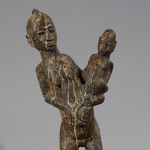 Both the mother and child are superbly rendered above the neck, with high cheekbones, half-closed eyes under arched brows, pointed noses and angular jaw. The proportions are more carefully observed than is common for these figures, with graceful rendering of details. The wood has an uneven patina from handling and the, possibly, the application of libations.